Flosteer ‘A’ weir Diaphragm Valve having rugged design to incorporating the best material available is proved by easy, smooth and maintenance free operation for a long time. Extra heavy-duty casting affords high resistance to atmospheric corrosion. Flosteer diaphragm valve reduces diaphragm travel for extended service and fine control. A wide choice is available for body materials, body rubber lining, types of operation and body end connection to satisfy the need of most industrial application. 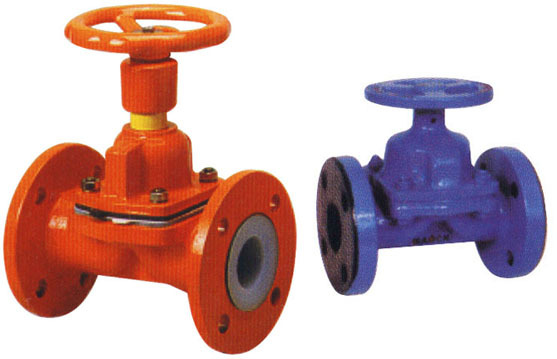 High quality standards are strictly maintained, each valve being checked for size, design pressure, operation, MOC, finish etc and with in house painting. Flosteer offers diaphragm valves with various body elastomers lining like P.T.F.E., Ebonite, Neoprene, EPDM, Hypalon & Butyl and others on request. Flosteer also can supply diaphragm valve with Pneumatic Actuator / Pneumatic Cylinder for ON-OFF or control operation along with accessories like Solenoid, Limit Switch, Air Filter Regulator, Valve Positioner, I/P Converter etc. Size Range 1 1/2" To 12"